I'm the kind of person that doesn't let much hold me back. I believe in pushing through and doing what needs to be done -- and I have a pretty high tolerance for pain. Last summer, I continued teaching even after I was diagnosed with pneumonia because I had committed to those classes. If I ever call in sick, you can believe that I am extremely sick. So, in early May when I wasn't feeling all that great, I didn't think much of it. We have been pretty busy -- and the kids' school year was wrapping down, and I was looking forward to days of fewer commitments. I thought I'd rest once the we got to the end of May. On May 16, I decided that I needed to visit my doctor. I felt rotten, and had what I thought might be a UTI. I headed into the doctor and told him of my symptoms and also complained of pain in my lower back. He said "Well, people don't usually get kidney stones on both sides, so I think it's probably just a UTI." and put me on antibiotics. Since I was on antibiotics, I assumed I'd be fine in a few days, and taught the classes on my schedule that week. I didn't feel much better, and as the week wore on I actually felt worse. Friday evening I remember giving Bo a hug and saying that I thought I better return to the doctor because it just didn't seem right that I still felt terrible. I went to bed early and then woke up around 4:30 in excruciating pain. Bo took me to the ER, and after some heavy duty pain medicine and tests found out that I *did* have kidney stones in both kidneys. One the one side, one was so large that it was actually stuck and wasn't going anywhere, and since it was completely blocking the urether my kidney was swollen. I had surgery on Sunday to place stents in my kidneys so that they could bypass my blocked urether. The next few days are a blur, but I spent a few days in the hospital and then came home to be in horrific pain in my own bed for a few more days. The pain finally started to let up on Friday, only to get worse (and different) by Saturday. And I found myself in the hospital again for a few more days. I still feel terrible. I'm not in excruciating non-stop pain, but I'm still in enough pain to bring me to tears at least once a day. I have tried to do small things (like taking the kids to Ridemakerz last weekend) and ended up in so much pain that I cried most of the way home. My days have been finding me in bed 90% of the time. The stents have been extremely uncomfortable when they are not downright painful. It is miserable to stand, walk, and ride/drive in a car. I have been trying to get up and do SOMETHING each day because it seems so absolutely ridiculous, but it just finds me back in bed feeling terrible. Today I got a call that I still have an infection and need to be on antibiotics. (I was on antibiotics for almost a full month already!!) Well, I guess that explains why I still feel terrible. 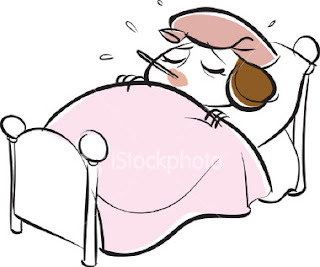 And, for those that compare kidney stones to labor pains -- I would much rather go through labor than go through kidney stones again. I am scheduled for laser lithotripsy next week in order to break up that huge stone that is stuck. There will be recovery from that, and then the stent will have to be removed later, and recovery from that, and then I hope this will all be behind me!! Nate & I have our trip to Texas planned for early July and I need to be better for that trip. I will go no matter what, but I would really prefer to go and enjoy the trip and not be in pain. We will be at the National Stuttering Association's annual conference!! I was hoping for a more laid back summer -- but this was NOT what I had in mind! I am grateful that my husband is so amazing and has done everything so that I can rest in bed to recover. I'm trying not to think too much of the money I haven't been able to earn . . . all the classes I had to give up. Or of all the medical bills that will start rolling in that won't be covered by insurance. It will all be taken care of somehow. I'm sure of that. I am not as sick as I was that first week -- when all I did was sleep. I'm definitely better than I was, but it's hard for me to be unable to do much of anything! I probably won't write much more about this, because I personally think it's boring -- but I thought it important to mention what's been going on. I have a bunch of things I want to review -- some that have been sent to me and others that I just am very pleased with that I want to share. I imagine my next post about my health will simply be to say that I am BETTER and back to work! Wow - I want to kick your doctor. I *frequently* have kidney stones on both sides, it is not that unusual. He should have checked you with those symptoms right away. :( I'm so sorry Melanie. I know how painful it is and it is frustrating that poor medical decisions are making this so much worse. What was the rationale behind waiting so long to do the lithotripsy? [I had mine the day after they discovered the huge stones, even though I had kidney infections on both sides too]. You will feel much better after the lithotripsy but it may take a few days of healing before you start to feel the results. :( :( God bless you - I'm praying for you but I wish I could be there to help too. Slow down for now and take care of yourself now so that you can really get back to things when you are truly better. I'm also glad that Bo and the sibs are handling so many things. Sorry there's not more/anything that I can really do from here. Oh, I am so behind on my blog reading, I caught a few FB posts, so I knew you weren't well, but had no idea how bad it was! I have had kidney issues before, I know how extremely painful that can be. Hang in there and try not to worry so much about what's not getting done. I'll keep you in my prayers! The Circus is in Phoenix!